SIDNEY — It has rained everyday for a week and the outlook for this weekend doesn’t look much better. A flood warning for the Great Miami River near Sidney lasting through Friday afternoon was issued by the National Weather Service, along with a flood warning for most of Shelby County that was extended until Friday morning. Various roads have been closed because of high water, the city of Sidney initiated its flood plan, and water rescue missions were carried out by firefighters. The wastewater treatment plant in Sidney reported 1.63 inches of rain fell on Wednesday alone. In New Bremen, 3 inches of rain fell between 3 a.m. and noon Wednesday. There is a 60 percent chance of rain Thursday night and a 20 percent chance Friday. Chance of rain on Saturday is 80 percent and a 60 percent on Sunday. Cardo Road was completely impassable because of road-way that was ripped off the top of a culvert. Shelby County Engineer Bob Geuy said they weren’t sure if it was just water that caused the damage or debris that got caught, or a combination of the two. 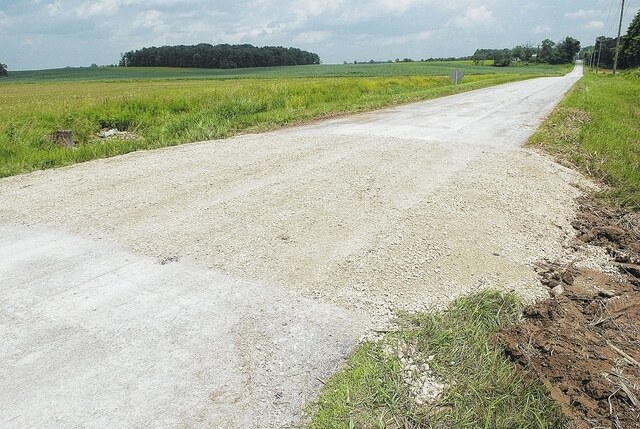 Several other roads will need minor repairs around the county. Including repairs to the berm of some roads that got washed away and collecting field debris that accumulated on roadways. He said repairs should be completed in a couple of days, hopefully by the beginning of next week. Geuy said as they expect more rain in the next couple of days they will be monitoring the roads very closely. As of noon Thursday water was receding in a lot of places, but officials don’t know how long that will last. Lockington firefighters rescued three men from a car that had stalled in flood waters on Miami River Road near the intersection of East Lockington Road at about 10:20 Wednesday night. Lockington Fire Chief Jon Adams said signs were posted that the road was closed due to high water and the driver was cited for disregarding those signs. No one was injured. The city of Sidney’s Flood Action Plan was initiated at noon on Wednesday as the level of the river had reached 10.5 feet. The city staff continued to monitor river levels throughout the day, city officials said. The river crested at 12.5 feet at 6 p.m. on Wednesday. The river level was 11.12 feet Thursday morning, officials said in a news release issued shortly after 9 a.m. With more rain forecast through the weekend, city departments will continue to monitor the situation. Gary Clough, assistant city manager/public works director for Sidney, said Thursday afternoon the water level is continuing to come down and streets are in better shape. The city did not close any streets Wednesday, although workers did put up warning signs in the area of Sidney-Freyburg and Hoewisher roads because of high water, Clough said. City workers have taken preventative measures to clear blockages of storm sewers, Clough said. The city has installed pipe in Harmon Field, located between St. Marys and Wapakoneta avenues, to improve drainage through that area. Clough said those improvements worked as they were designed to Wednesday, with the overflowing water continuing down the swale. The Sidney-Shelby County YMCA closed Wednesday, reportedly because of high-water-related problems. It was reopened as of 5 a.m. Thursday. The Sidney Parks and Recreation Department reported Thursday afternoon that all fields at Flanagan Sports Complex will be closed until further notice due to flood conditions. Some roads remain closed in Auglaize, Logan and Mercer counties. The American Red Cross has opened an emergency shelter at Bellefontaine Middle School for flooding evacuees. Red Cross workers are providing warm meals, a safe place to sleep and emotional support for those with immediate, disaster-caused needs. The shelter has been opened since Wednesday evening. Disaster-specific checklists and other resources can be found on redcross.org.